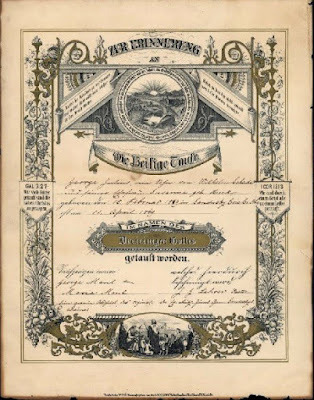 A baptismal record for George Julius Schade is in the collections of the Sandusky Library Archives Research Center. 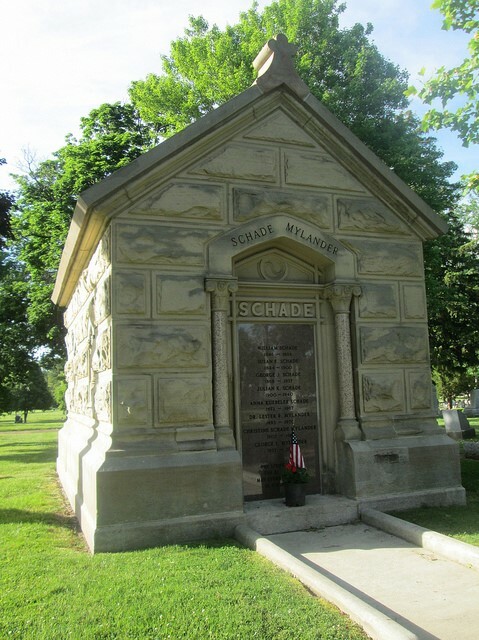 George J. Schade was born on February 15, 1869, in Sandusky. His parents were Wilhelm (later known as William) Schade and Susanna Heck Schade. Rev. J.G. Lehrer, pastor of Zion Lutheran Church officiated at the baptism, which took place on April 11, 1869. The baptismal sponsors were George and Maria Maul. All the words on this baptismal record are in German. Bible verses from Galatians and I Corinthians are found on either side of the document, which is decorated with intricate engravings. 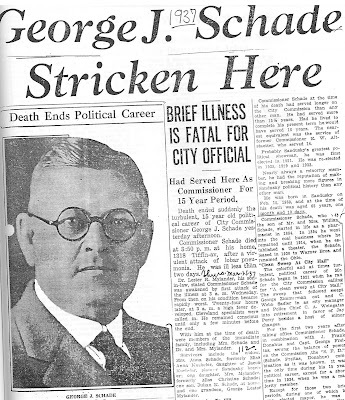 The life of George J. Schade is well documented at the Sandusky Library. 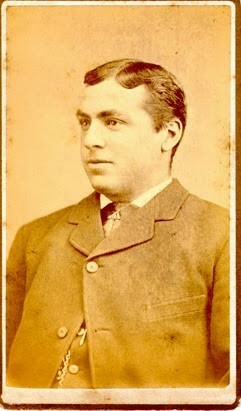 This carte de visite shows him as a young man. 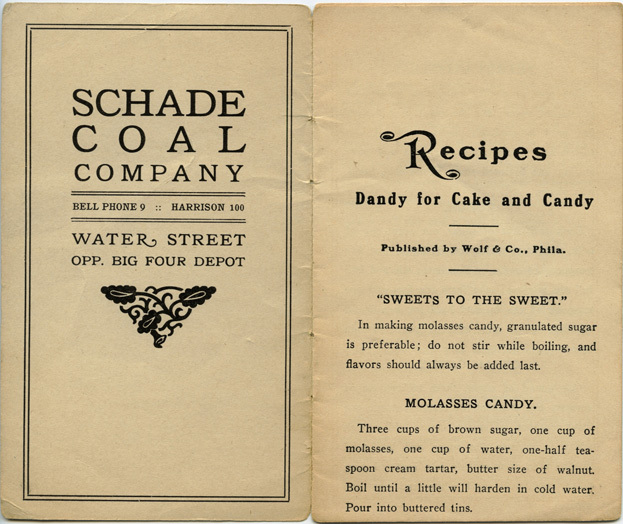 From the early 1900s to 1921, George J. Schade was the manager of the Schade Coal Company, located at 810 West Water Street, across from the Big Four Depot. At the time of his death in 1937 he had served longer on the Sandusky City Commission than any other person. 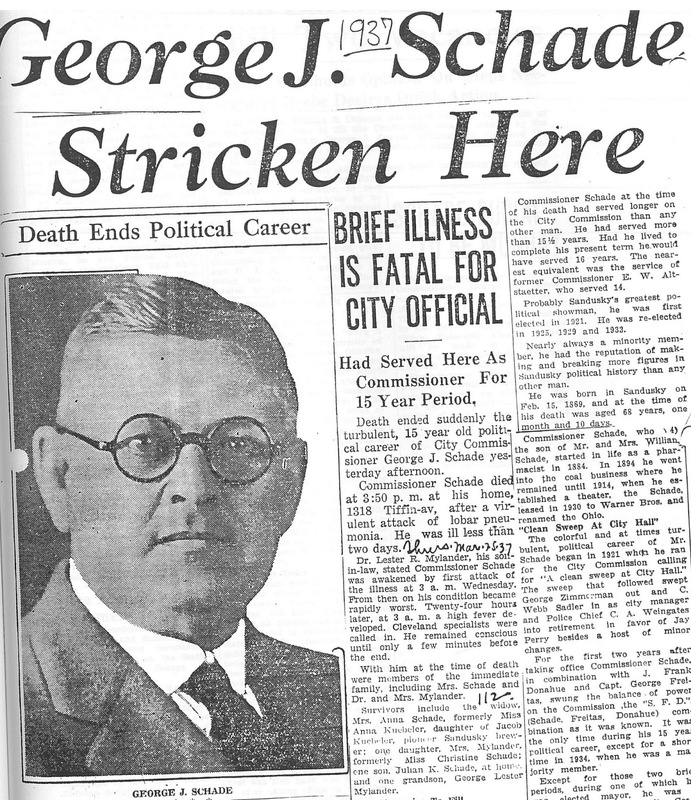 Mr. Schade had been a pharmacist, and owned the Schade Theater. Page 40 of the 1937 Obituary Notebook features a lengthy obituary which had been clipped from a local newspaper. George J. Schade was married to Anna Schade, the daughter of pioneer brewer Jacob Kuebeler. He was the grandfather of George L. Mylander, who went on to serve his community as a well-respected educator, philanthropist and civic leader. They are buried in the family mausoleum at Sandusky’s Oakland Cemetery. 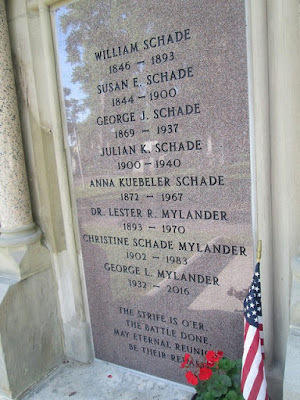 When you look closely at the door to the Schade-Mylander Mausoleum, you can learn a bit of family history of several members of the Schade and Mylander families. This is an interesting article, especially because I have a 91-year-old friend here (she's about 30 years older than me) whose last name is Schade. Next time I see her, I'll ask if she knows if her husband's family was from Ohio.